Quark cooking sauces - a light touch and a saving grace! You know that feeling when you get home from a holiday and all you have in the house is bread, milk and butter? When you've nearly lived on sandwiches and other bread-based foods for a week, bread is NOT appealing. That was me last weekend when we arrived from Devon. As I drove for the last few miles, my mind tried to figure out what Saturday tea was going to be. It could be Chinese take away from the reopened one around the corner. It could be pizza. Or it could be a supermarket dash to get ... er, something. Then we got home and I found a missed delivery card through the door, and I realised that a parcel had been left round the back. I sent Monkey to get it but he said it was too big for him to pick up. Husband was dispatched to get it whilst I emptied bags and checked post. What came in was a massive hamper containing Lake District Dairy Quark cooking sauces and the ingredients to make a number of dishes. It was like someone knew! I had no idea it was coming and I hadn't seen any emails about it. Lucky we were coming home that day. The cooking sauces are designed to be lower in fat and higher in protein than other sauces but a great way to make a meal quickly. The recipes I received with it were nice and simple and tea was ready within about 15-20 mins. 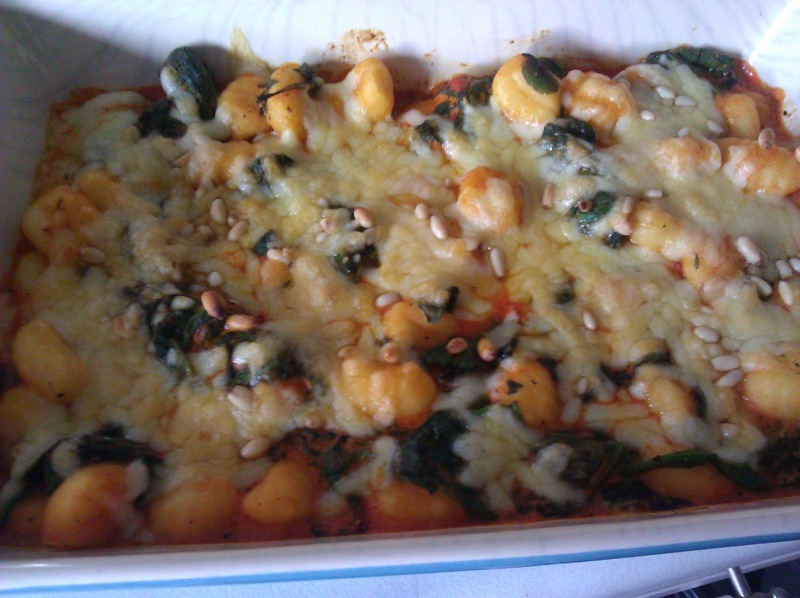 First, I made baked gnocchi in the tomato and basil sauce. After initial moans from the children, they decided it smelt nice cooking and it delivered on the taste front too. The following day, we had spaghetti "quarkonara" with a garlic and herb sauce. I added mushrooms to this so there was a bit more cooking but it was a case of cook spaghetti, drain, add sauce and ham. I found the recipe to be quite dry and kept adding leftover cooking water. I certainly didn't enjoy it as much as a regular carbonara - it was too garlicky for that. The kids loved it but they love pasta, full stop. I think I prefer the egg yolks to be honest. They compared to making it with cream cheese but I have never made a carbonara with cream cheese! I didn't get a photo of this, it went too quickly! We did however all really enjoy the chicken tikka and quark rice. The children are scarred by me overspicing Indian dishes so were dubious but they needn't have worried - the sauce was not too hot but flavoursome. 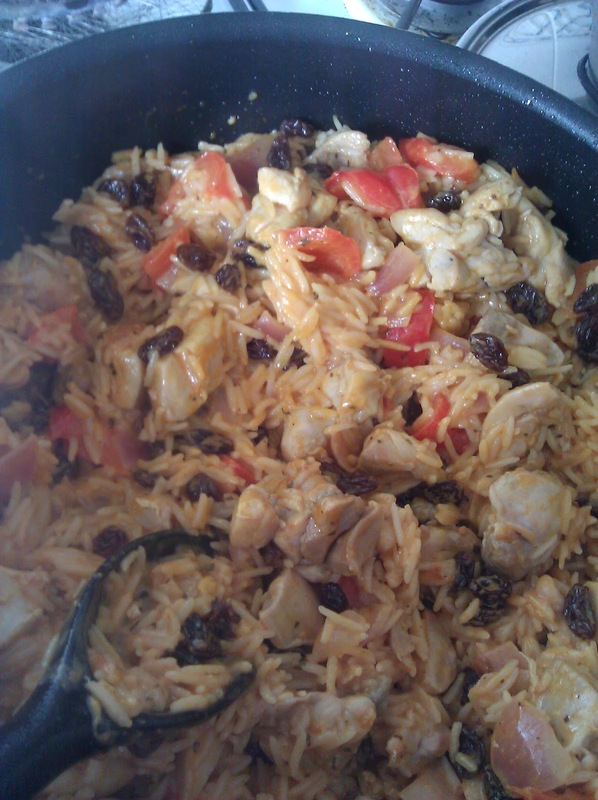 The dish was more a biryani style - I was sent pre-prepared rice but I think they should have sent uncooked rice so I added some myself, otherwise it wouldn't have been enough. Adding the raisins and the almonds added a nice contrast to the dish. I did get sent some coriander but the day before I made this, my fridge went into overdrive and froze some of the contents, which destroyed it! Monkey doesn't really like it on his food anyway. The quarkonara aside, I liked these sauces. I would definitely make the chicken tikka again and I think the gnocchi would also work well with the garlic and herb sauce. I often forget gnocchi as an option for a meal and they are all even quicker to cook than pasta so it was a timely reminder to build them into more recipes particularly when time is short of an evening and I want to cook a fairly healthy option. Meal Planning Monday - the yes I am still blogging edition! So I haven't blogged in a month. I've still been meal planning although I didn't on our week's holiday. Time has just ran out on me on turning my plan into a blog post. Not this week. Hurrah, I hear you cry. Well, I can dream. This week. There's only 5 days on the plan because we are going to a wedding in Devon on Saturday. And yes, we got back from Devon only 9 days ago. That's how it goes sometimes. Apart from that, it's a normal school week, peppered with swimming on Wednesdays after school now - I thought I'd got them in at exactly the same time, until Monkey went to his first class with the new teacher and she decided he was so good he has to move up again and now has a lesson straight after Missy. We're also now looking at secondary schools, although we don't have to apply until next year, but I think there are none to go see next week. Don't forget that Mrs M has the Meal Planning Monday linky. Go see her, she's having a tough time right now and I'm sure a visit and a friendly comment will give her a bit of a boost. Til next week. I hope!